"The all-new Air Hogs Battle Tracker delivers head-to-head interactive combat. Take command of the Disc-Launching Helicopter as the A.R.T (Automated Robotic Turret) tracks your every move. Enter the heat of battle with both single and multiplayer modes: Single Player: Auto Mode. Take control of the heli and launch disks at the A.R.T antenna. But, beware. A.R.T tracks your every move while releasing a devastating payload of missiles. Don't underestimate the advanced intelligence tracking system as you go head-to-head in battle. 2-Player: Manual Mode. Easily switch to manual mode using the A.R.T remote control. Face-off against friends and see who will be victorious. Switch roles as you control 2 different advanced weapon systems and discover each of their advantages. 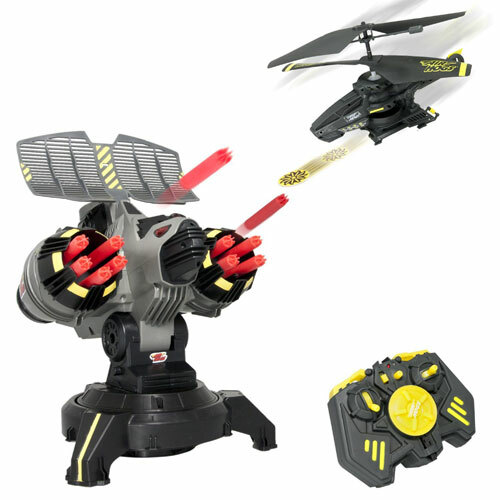 Other Modes: Both the A.R.T and Disk Shooting Helicopter can be controlled independently. Battle them against other Air Hogs vehicles and become the ultimate battle-ready sharpshooter. Disk Launching Helicopter: Launch your way to victory with the high-powered disk launching heli. The resilient hard-plastic body is armored to withstand all combat scenarios." Nobody has reviewed this item yet Be the first to write a review! Entire Store Contents © 2003-2017 BananaToys.com, Inc. All Rights Reserved.